The Three Principals with Two Grand Superintendents: E Comps Keith Fisher, H, John Bennett, MEGS, Richard Ellis, MEZ, Denis Calderley, PMEGS, and Ray Beckingham, J. The next Item on the Agenda was the Induction of the three Principals. E Comps John Bennett and Denis Calderley were placed in H and J Chairs respectively and E Comp Mike Scaggs Inducted E Comp Richard Ellis as MEZ. Richard then Inducted E Comp Keith Fisher as H, who then Inducted E Comp Ray Beckingham as J. MEGS John Bennett then gave the Charge. The Principals then appointed their Officers. Next item on the Agenda was dealt with by MEGS who took the Sceptre. MEGS then welcomed the PGM, APGM. He then spoke of the sad loss of Christine Biggs and stated that E Comp Bob would be pleased to receive phone calls. The Calderley Honours Board was now in Wedmore and a Dedication Ceremony will be done at the next Meeting. Avalon Chapter’s Honours Board would also be Dedicated at a suitable date. The Provincial Book is nearing completion of the editing stage and will be published in about eight weeks. MEGS then pointed out the new Chapter carpet noting the Signs of the Zodiac, which was unique in Somerset. The next part was related to the CLOs and how they were dealing with the updating of the website. There were concerns over the method of putting things on the website and those being non computer literate having volunteered for this post in coping with the situation. Quite a lively discussion was had with many Comps taking part. Once again if CLOs have problems please contact E Comp Adrian Halliwell. 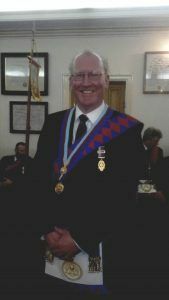 Neil is a member of Wrington Vale, No 1199, and Somerset 1st Principals Chapters, No 3746, and was Provincial Grand Steward in 2009, Past Provincial Assistant Grand Sojourner in 2010 and Provincial Grand Scribe Nehemiah in 2015. E Comp Terry Hayes (Provincial Treasurer) appointed to Past Grand Standard Bearer. Megs also discussed his “retirement” which Supreme Grand Chapter said was the “cessation of his 10 years Patent”. John also said that the Past 2nd Grand Principal would be in attendance at the Webbington Convocation in May. The Next Meeting will be held on Thursday 20th September at Wedmore Masonic Hall and the meeting was closed with Companions retiring downstairs to the Festive Board where a delightful meal and discussions ensued.